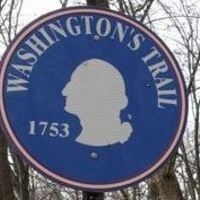 This event combines the annual "Cherry Pie Hike" and "Washington's Trail Hike," commemorating George Washington's birthday and the Virginia Colony mission demanding French withdrawal from British territory that precipitated the French and Indian/Seven Years War. It will feature 30-minute history hikes, where visitors can witness the 1753 musket shot that could have changed history. There also will be informational presentations and displays, a reenactors' camp portraying wilderness life of the time period, 45-minute winter nature walks, and two-hour hikes along a section of the North Country Trail where Washington may have traveled. Pick your favorite hike option and enjoy a taste of cherry pie, courtesy of North Country Brewing Company. The event is free and open to the public, but reservations are requested for hikes and nature walks. Call 724-452-7341 to reserve a time. Sponsoring organizations include Washington's Trail 1753, the Butler Chapter of the North Country Trail Association, the Harmony Museum, Butler County Tourism and Convention Bureau, and Jennings Environmental Education Center.